There’s a lot of confusing information and advice out there around sugar; it has been made out to be the villain of our diet, but does sugar cause cancer? Does sugar feed cancer cells and make them grow more aggressively? 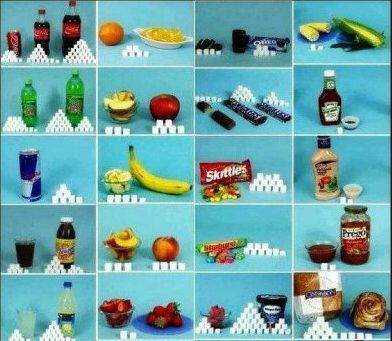 How does the sugar we consume via our food and drink affect our health? Should cancer patients eliminate all sugar from their diet? As a culture, we are very addicted to sugar, and marketing companies know that children especially love sweet things and aim their advertising at children in such a way that they are forever eating and drinking snacks loaded with sugar. Retail stores play into this by placing sweets, chocolates and sugary drinks at the till-points and at lower levels where children can see or get to them. This article seeks to explain what sugar actually is, why the amount of sugar in our diets is cause for concern, and why a high-sugar diet can be bad news when it comes to cancer risk, although not for the reasons that one often sees in the headlines. ‘Sugar’ is a catch-all term that refers to a range of molecules including simple sugars found in plants, glucose and fructose. These molecules of simple sugars can stick together, either in pairs or as longer chains of molecules. 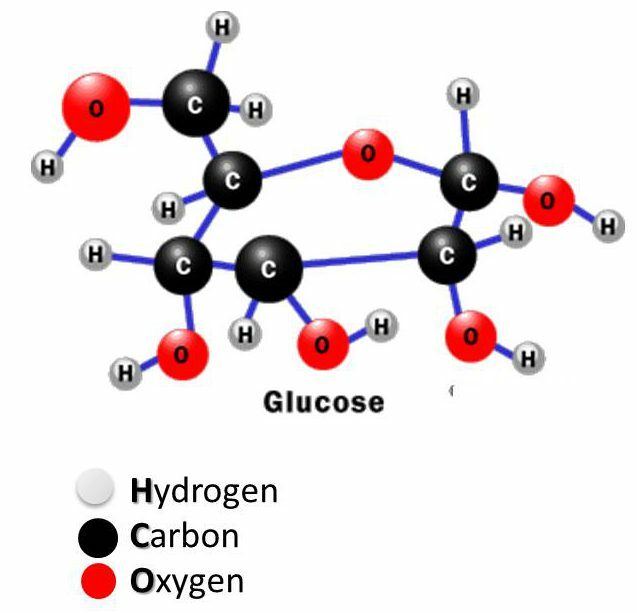 All sugars are carbohydrates, commonly known as carbs – molecules made from carbon, hydrogen and oxygen – and our body’s main source of energy. crystals of glucose and fructose. Table sugar is refined, meaning it’s been processed to extract it from a natural source (usually sugar beet). Unprocessed foods can be high in simple sugars too, for example honey (also made mostly of glucose and fructose) is nearly pure sugar. As these chains of sugar get longer, they will no longer dissolve in water and they lose their sweet taste – these longer chains are called polysaccharides and form a large component of starchy foods such as rice, bread, pasta and vegetables like potatoes. Many things that we eat contain sugar in some form or the other, which is good because our bodies require sugar to work. The human body is made up of living cells, all of which need energy to survive and perform their duties. These cells somehow need to turn nutrients in our diet into a form of energy that they can use, called adenosine triphosphate (ATP), and the process starts with glucose. If for some reason there is no carbohydrate in our diet, cells will turn fat and protein into glucose as a last resort, because they need glucose to survive. 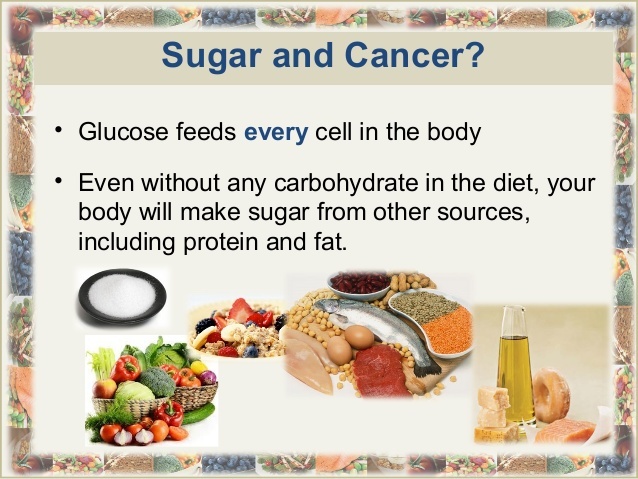 All of our cells, cancerous or not, use glucose for energy. Because cancer cells usually grow very fast compared with healthy cells, they have a particularly high demand for this fuel, and this is where sugar and cancer start to collide – if cancer cells need lots of glucose, then cutting sugar out of our diet must help stop cancer growing, and could even stop it developing in the first place, right? It is not quite that simple; all of our healthy cells need glucose too, and there is no way of telling our bodies to let healthy cells have the glucose they need, but not give it to cancer cells. There is absolutely no evidence that following a “sugar-free diet” lowers the risk of getting cancer, or boosts the chances of surviving if you are diagnosed. Following a severely restricted diet with a minimal amount of carbohydrates could damage your health in the long term by eliminating foods that are good sources of fibre and vitamins. This is especially important for cancer patients because some cancer treatments can result in weight loss and put the body under a lot of stress. Poor nutrition from restrictive diets could also hamper a cancer patient’s recovery, or even be life-threatening. Although there is no evidence that cutting carbohydrates from our diet will help treat cancer, research has shown that understanding the abnormal ways that cancer cells make energy could lead to new treatments. The fact that cancer cells use a different chemical process from normal cells to turn glucose into energy was discovered as far back as the 1920s by a scientist called Otto Warburg. Healthy cells use a series of chemical reactions in small cellular ‘batteries’ called mitochondria. The Warburg Effect, as it was dubbed following Otto’s discovery, describes how cancer cells bypass their ‘batteries’ to generate energy more rapidly to meet demand. This shortcut for making energy might be a weakness for some cancers that gives researchers an advantage for developing new treatments – it opens up the potential for developing drugs that shut down cancer cells’ energy-making processes but don’t stop healthy cells making energy. These abnormal processes in cancer cells can also leave them less able to adapt when faced with a lack of other nutrients, like amino acids, and this too could lead to new treatments. Cutting out sugar doesn’t help treat cancer, and sugar doesn’t directly cause cancer, BUT there is an indirect link between cancer risk and sugar. Consuming a lot of sugar over time can result in weight-gain and there IS cast-iron scientific evidence that shows that being overweight or obese increases the risk of 13 different types of cancer. Added sugar is the problem when it comes to weight gain, not sugar that is naturally found in foods like fruits and milk or healthy starchy foods like wholegrains and pulses. The easiest way to lower your added sugar intake is to cut down on sugary drinks such as fizzy drinks and energy drinks which have more than the recommended daily maximum amount of added sugar in one single serving. Other obviously sugary foods such as sweets, chocolate, cakes and biscuits are all best kept as treats too, but it is often the high hidden amounts of sugar that we do not know about in breakfast cereals, ready meals (including ‘healthy’ ones), pasta sauces and yoghurts that can do the most damage. This is why it is vital that you read the nutrition information labels and ingredients list before purchasing or eating these kinds of foods. While there are certainly steps that you and your family can take to cut down on added sugar, making these changes can be easier said than done. It is here that governments need to step in. Certain governments, including the South African government have either recently or are about to pass a sugar tax, which is a really good thing as it can prevent millions of cases of obesity, thereby also reducing future cases of obesity-linked cancers, by reducing the amount of sugar the nation consumes in fizzy drinks as well as in foods that are popular with children. Reduce the amount of added sugar in your diet and maintain a healthy body weight. Eat more whole fruits, vegetables, whole-grains and pulses, as these nutritious foods are also high in fibre – this will not only help your body digest the natural sugar more slowly (which helps you maintain a healthy weight) but it will also reduce the risk of bowel cancer.